How many times have you sent an email to someone, but forgotten to also send an all-important attachment? If you're like most people, you've most likely done it a fair number of times. CatchAttach (€2) aims to make sure you never do it again--in Outlook, at least--but only partially succeeds at the task. 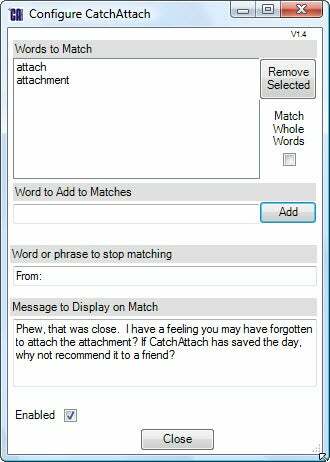 CatchAttach tells you if your Outlook email lacks an attachment, but only if the word "attach" is present.